Now you can not only assign clients to a particular work order type, but also assign work order types to a particular client. This can save you a great deal of time when, for example, you need to reassign a certain client from old work order types to new ones. Note We have also moved the links to the Services, Client Users, and Contacts pages from the main view to the Select menu to free space on the Clients page and make the interface more consistent. 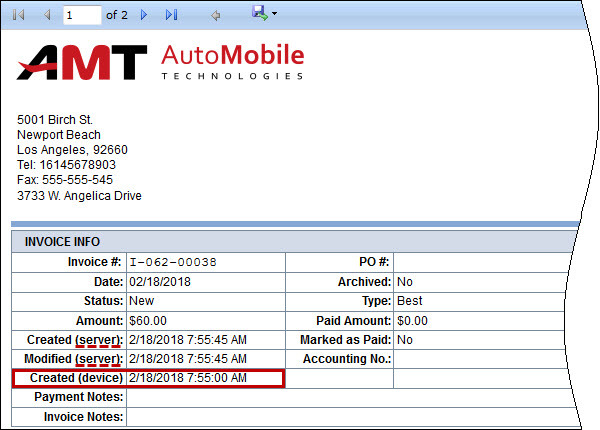 We have added the Created (device) date and time that shows when invoice was created on device. This allows you to see how much time the processes take by comparing the time difference between invoice creation vs. emailing, exporting, etc. Note The word (server) was added to the Created date & time and the Modified date and time to avoid confusion. On the Invoices page, in the Action column, point to the Select button next to the appropriate invoice, and then click Tech. Info. The price of inspection services with the Money, Labor, and Parts price types can now be edited on the Quick Access page while approving draft and new inspections. Note Only users with the Administrator, Area Administrator, Team Administrator, or Accountant role can edit inspection service price. Important! This functionality is not available by default. Please contact customer support with request to turn on this feature.